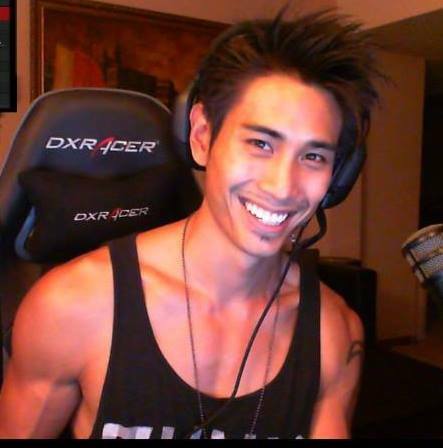 Kansas City gamer Anthony Kongphan has been using the online video game streaming service, Twitch, for more than four years. With more than 83,000 followers and a vast multitude of subscribers, he often uses his stream to raise money for charities such as the Great Strides Cystic Fibrosis Foundation, a charity for children suffering from the disease. He raised more than $13,000 for the group during a stream that lasted more than 43 hours April 28. (Photo submitted) Kongphan behind his computer. 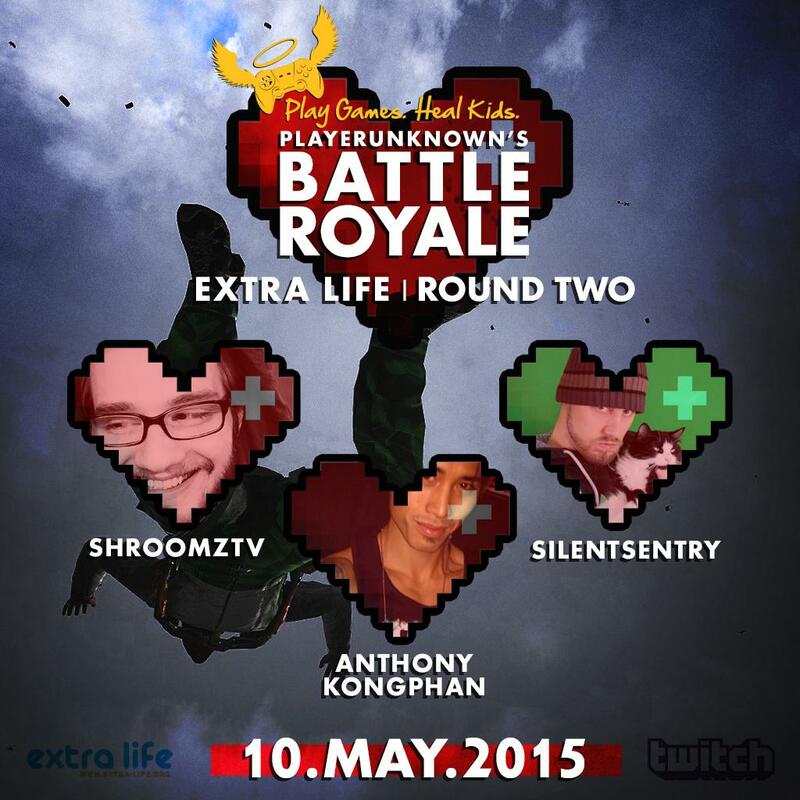 Kongphan is planning another charity stream May 10 (today) as part of PlayerUnknown’s Battle Royale supporting the Extra Life charity. According to its website, Extra Life is a charity that started with a 24-hour video game marathon to raise money for the hospital that treated Victoria Enmon, a young lady who had acute lymphoblastic leukemia. Since then, Extra Life has become a way for thousands of gamers, more than 100 websites and thousands of donors to help kids closer to home as the charity works with Children’s Miracle Network Hospitals all over the country. After Kongphan’s nephew spent time at Children’s Mercy Hospital, he found a desire to use his stream for charity. The charity stream will feature Kongphan playing with two other Twitch personalities, SilentSentry and Shroomztv. Kongphan said he and SilentSentry play together a few times during his normally scheduled streams, from 6 p.m. to midnight CST Monday through Friday, but Shroomz plays a different schedule. Kongphan said he decided to get involved with Extra Life because he knew the host and wanted to jump on board for the cause. “I was first approached by ‘PlayerUnknown’, the mastermind behind the popular Battle Royale mod for Arma 3, and of course knowing him personally and it was for a great cause I accepted the invitation,” Kongphan said. During the Great Strides charity stream, Kongphan’s followers helped him raise more than 400 percent higher than his original goal. Kongphan said it was surprising to raise that much money for charity. After his latest charity stream’s success, Kongphan said he thinks his community of followers, affectionately called ninjas, will support the Extra Life event as well. (Photo submitted) Kongphan raised more than 400% of his goal for the Great Strides charity. Kongphan has a reputation of long streams, and when asked how long his Extra Life event would last, he refused to put a time limit on it. As far as which games Kongphan and his fellow streamers will play, he said he will probably play a rotation of games. Kongphan said his next charity will be the 8-bit Salute Fourth Annual Gaming for the Troops event, which will take place May 16. 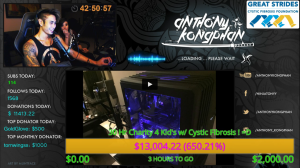 Kongphan’s first charity stream was Nov. 25, 2013, for Child’s Play charities. He said since he did the 24-hour stream he’s been addicted to doing charity streams. All of the charities he’s worked with thus far are focused on children. The 8-bit stream will be a 60-hour event and the first time Kongphan has done a charity for wounded veterans. Kongphan got his start with streaming when Twitch was brought to his attention by a friend and streamer who thought his personality and energy would lead to a successful stream. He had success with his stream and now it functions as his full-time job. Kongphan said his stream is unique because he tries to be himself, and he models his stream off of a user he enjoys watching. Kongphan said he primarily plays post-apocalyptic zombie game DayZ because that’s what his fans prefer, but he hopes to move on from there eventually. Lately on his stream, Kongphan has been switching between DayZ and Grand Theft Auto 5. He said he chooses what he plays based on how he feels about a game. He said he gets excited to play for content, such as streaming Tomb Raider, and he loves to beta test games. Kongphan said his stream is his dream job, and has introduced him to many great people. Kongphan said he tends to put real life on the backburner for his stream, but has taken a liking to riding his motorcycle and spending time with his family. When he’s not streaming, Kongphan said he plays more video games off stream and frequently goes to the movies alone. Kongphan said he had to truly dedicate himself to his stream to make it so successful. Follow Kongphan on Facebook, Twitter, and his Twitch channel where he streams from 6 p.m. to midnight CST Monday through Friday. nice journalism(sarc) there was about 40 streamers involved in the Battle Royale event, raising aprox total of 43000$ within 5 hours..
That is correct, it was a huge event. Our article focused on Anthony and was posted before the event took place. We didn’t intend on anyone to get salty over a story centered on a streamer from Kansas City. Cheers!